Stop the wicked schemes of an evil pharaoh before your city is annihilated in this heart-stopping match-three adventure! When the vile Tutmos sets in motion his plan to achieve immortality by reciting an incantation that unleashes a deadly plague, you must save your people by destroying the unholy altars that are sustaining the pharaoh's spell. As the hero of this captivating tale, you must create chains of three or more matching elements to clear the levels that stand between you and the altars. Along the way, you'll unleash powerful combos by creating uniquely shaped matches, call upon the gods for help, and upgrade the spirits to make them more powerful. You'll also use your matching prowess to defeat mighty bosses, earn rewarding achievements and complete deviously designed boards packed with challenging obstacles. 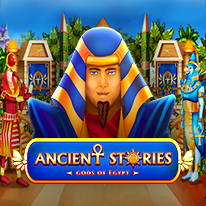 With Standard, Advanced and Untimed (casual) modes, Ancient Stories: Gods of Egypt offers a thrilling experience for every player. Will you stop the incantation before Tutmos spells doom for your city?